Just thought I would write and tell you how very happy Cathryn and I are with our new waterbed. 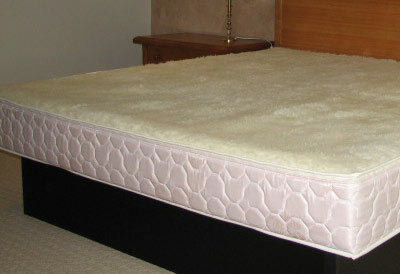 You did an excellent job setting up the bed for us and gave us many great tips on how to keep the bed in top condition. We are very impressed with your attention to detail. I bought my first waterbed about 34 years ago due to having continual back problems caused through playing tennis. I have not regretted my original purchase which has over all these years, allowed me to be pain free. Once again, thank you for all your help and advice. Thank you Colin for the care and support you gave us when our OLD water bed gave up. We appreciate your advice and service. We are very pleased with the new version of our water bed. Just a quick email to say I am loving my waterbed. I am sleeping much cooler and it is so restful and relaxing. Wish I had done this years ago. I cant wait to climb in at night and hate to get out in the morning. 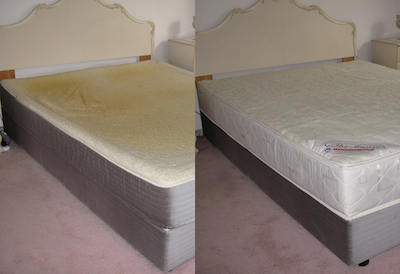 Just wanted to thank you for your service with my waterbed, I can’t believe what a difference it has made. I have a back issue that causes me pain at night and called Colin in desperation having tried several beds, mattresses and overlays with no success. He came out the same day and installed a waterbed for us to ‘try before we buy’. From that first night I have had pain free, blissful sleep. I am now a convert to the joys of owning a water bed and in fact have had Colin come out again and upgrade us since the initial trial. I would recommend a waterbed to anyone with back problems and cannot speak highly enough of Colin’s prompt, pleasant and knowledgeable assistance. I write to express my complete satisfaction with the service that we have received this week for our aging waterbed. A leak was detected on New Year’s Day, so I tried ringing the number on the website, for help. I was astonished to receive a return call from you, on New Year’s Day, along with several very helpful pieces of advice, which were easily implemented. I was very pleased indeed to receive your visit today, a mere two days later, prepared to install a new mattress, with the associated empties and fills. I would like your customers and potential customers to know the excellence and total reliability of your services. Many sincere thanks for the timely rescue! A very satisfied customer. . .
What a change. Forgotten what a good sleep was like. It is now so different. Just a short review, people never read long ones. Thank you Colin for a prompt and professional job. Also the advice on how to maintain your waterbed was invaluable. Just a quick note Colin to thank you for your assistance a couple of days ago. Initially believing I could handle the resettling of our water bed from our old address, I’m glad I took your advice. With you being on site it became obvious that if I had of proceeded, rather serious problems would have developed and I was glad to step back and allow you to do the appropriate things that were required. The following evening my wife and I had the best sleep and the unit is so different to the previous one, which we thought was so good at the time. Best regards Colin and may your service spread widely. Both Andreina and I would like to thank you for saving us thousands of dollars which we would have spent buying a conventional mattress to put in our solid wood framed waterbed. As we discussed it was getting harder to get out over the wooden side rails. You directed us perfectly to have one of the soft sided waterbeds, which I must say you installed with great professionalism and pride. You are from the ‘old school’ of integrity and manners. You even attached our sloping head board onto the new waterbed frame, cleaned up all the mess and took it away and even put our bedroom furniture back in its original place. Andreina and I would not hesitate recommending you to anyone who wants to go ahead with you, well done. When I was looking for a waterbed about 1 year ago, I called a couple of different suppliers on the internet. I ended up going with Colin because not only did he want to sell me a waterbed, he genuinely wanted me to have the best experience with my new waterbed and gave me a rundown of all of the maintenance and care in the first call. In comparison with the other companies I called, all they wanted was my money, but Colin was different. Now, with my kids being 2 and 4, all I wanted for them was the best sleep and support for their growing bodies and who best to call? Colin. He still remembers me and was able to come out so quickly. It was great seeing you again, and after buying three waterbeds from you, I only hope that we can recommend you to everyone we know because I have no idea how we used to sleep on a mattress, waterbeds are amazing. I’ll talk to you soon, and we can’t thank you enough. I just wanted to say thank you so much for everything, you are truly amazing and so knowledgeable with waterbeds. 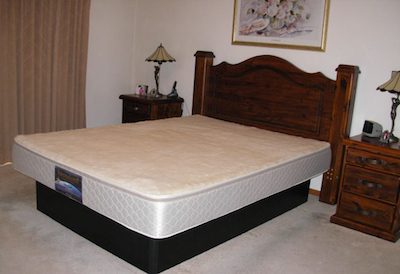 You think of everything and really manage the process of installing or removing a waterbed with ease. I would highly recommend you to anyone looking to buy or install or remove a waterbed. Terrific service. Have used Colin from Aarons Waterbeds twice to move house. Fast disassemble and set up. Intelligent, friendly man with years of experience and knowledge. Explains ways to maintain your bed in a clear and caring manner. Ensures you are totally happy with water level in your bed before leaving. Highly, highly recommended. Thanks for driving up to Mansfield to renew my mother in law’s old waterbed. Great service just as your card says, and great value. She’s as happy as Larry. I’d recommend you to any waterbed fans out there! Just to let you know the bed arrived and I have set it up. All went well and we are pleased with the unit. Thanks for your sales support and we will recommend you to others in our area that are interested in a water bed. If we have any question down the line we will contact you. I am very pleased with my revamped waterbed and your service, Bloody good job!